Injustice 2 received its first major update on June 5, courtesy of developer NetherRealm Studios. The patch largely addresses lingering bugs in the DC Comics fighter, but it also included a new indicator that notes whether online opponents are playing over wi-fi. While it may seem like a minor addition, this represents a major step forward for the genre’s netplay community, one that could also tear them in two. Playing fighting games online is always a risky proposition. Due to the frame-perfect timing needed to pull off some of the more intricate combos and punishes, even the tiniest bit of lag can mean the difference between winning and losing. There are a number of steps that folks who are serious about competing online take to try to cut back on this interference, but the easiest is simply connecting the console to the router directly instead of relying on a wireless signal. Most modern fighting games feature a general ping indicator to denote the strength of one player’s connection to another in online matches, but Injustice 2 now takes that one step further by also showing if an opponent is relying on a wireless connection. By some estimates, even those with decent ping can experience interference over wi-fi that isn’t present with a direct connection, making netplay a game of Russian roulette for those who rely on it for practice and high-level competition. Injustice 2 is the first fighting game to include this kind of indicator, and the community has been appreciative of the gesture. One top competitor, Brant “Pig of the Hut” McCaskill, went as far as to say that anyone playing over wi-fi would be banned from his weekly Red Hot Sundays training streams on Twitch, though he did walk that back shortly after. Although the Injustice 2 netcode is a vast improvement from the first game thanks to NetherRealm Studios’ improvements during ongoing development of Mortal Kombat X, wireless connections can still cause issues for high-level play due to intermittent packet loss. McCaskill acknowledges these strides, noting that matching up against players on the west coast and even as far as Europe from his home in Atlanta, Georgia provides decent competition, but he can still tell if someone is playing on via wi-fi (even if the connection appears stable otherwise) due to how the game feels. For McCaskill, a good online experience is vital to his training. As a husband and father of two with another child on the way, he rarely gets time to sit down and train. This means that every minute he spends with Injustice 2 needs to be as perfect as possible to avoid developing the poor habits competitors can develop through constant online play. Upon posting news of this update, NetherRealm Studios community site Test Your Might was quickly divided between fans happy to see the wi-fi indicator added and those frustrated that it would keep them from finding games online. Unlike other fighting games, Injustice 2 allows players to drop out of a match before it begins if the ping isn’t to their liking, and some saw the dreaded symbol as a scarlet letter that might belie an otherwise stable connection. Some even found a perverse kind of joy out of being able to expose wi-fi players. Casual matches are one thing, but the stakes raise tremendously when major tournaments rely on netplay for qualifiers. Following their successful Mortal Kombat X events over the past couple of years, Warner Bros. Interactive Entertainment and NetherRealm Studios recently announced an extensive competitive circuit for Injustice 2 that kicked off on May 20. In addition to allowing players entry into the October grand finals by competing at offline tournaments like Combo Breaker, Community Effort Orlando, and the Evolution Championship Series, competitors can also qualify from the comfort of their own homes in online brackets. Like their work on the Capcom Pro Tour’s netplay qualifiers, event organizers Level Up Series have set a strict 3Mbps upload minimum for participants of Injustice 2 Pro Series Online tournaments. However, the regional portions of the Injustice 2 Championship Series—GameStop Hometown Heroes (North America), Path to Pro (Europe), and Liga Latina (Latin America)—don’t require players to meet any such criteria before competing. To some, this means players could potentially earn a shot at the main event’s $300,000 prize pool on the back of a crappy connection. Gray, a former ESL employee who is now working on the Injustice 2 Championship Series as a freelance producer, believes the upload minimum implemented by Level Up in Pro Series competition is a good idea. That said, those events typically feature smaller brackets than the weekly online tournaments, making such restrictions hard to enforce in separate qualifiers like Hometown Heroes. We reached out to ESL as well, but they were not available for comment before publishing. McCaskill doesn’t think the upload minimum does enough to maintain a quality playing field online. 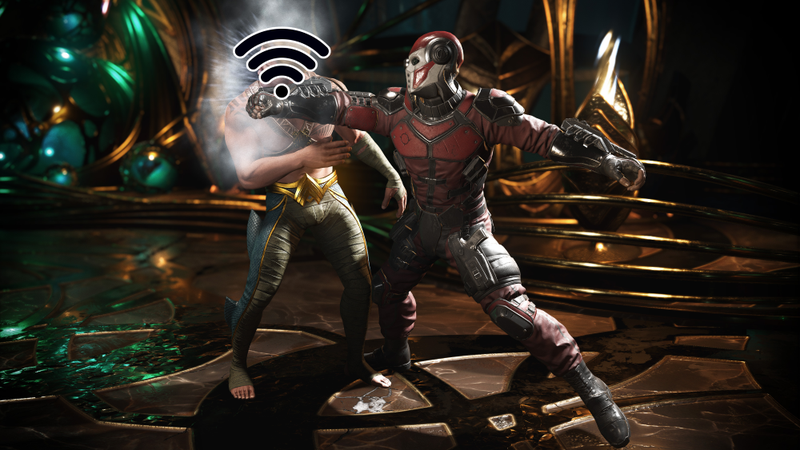 NetherRealm Studio, he believes, implemented the wi-fi indicator with a purpose, and thinks future seasons of online Injustice 2 competition will see more stringent policies when it comes to player connections. In order to qualify for the Injustice 2 championship event, McCaskill is scheduled to attend most of the offline events between now and September, but he also plans to bolster his spot in the overall rankings with online tournaments despite the loose regulations. “I’m taking Injustice 2 seriously, not just for the next two or three months but maybe the next two or three years,” he concluded. With clear indications of a player’s ping and wi-fi status, it should be much easier for the Injustice 2 organizers to impose more stringent sanctions in their online tournaments. Such fighting game events have been looked down upon as inferior to their offline siblings due to unreliable netcode. Now, with Injustice 2 offering some of the best online play the genre has ever seen and the Pro Tour’s growing reliance on netplay, it’s become increasingly clear that the developers will need to implement additional competitor requirements or risk losing vital momentum.